The golden goal which ensured Cove retained their title came in the 24th minute when Mitchel Megginson showed his predatory instinct to finish off man-of-the-match Daniel Park’s low cross for the striker’s 36th goal of the season. 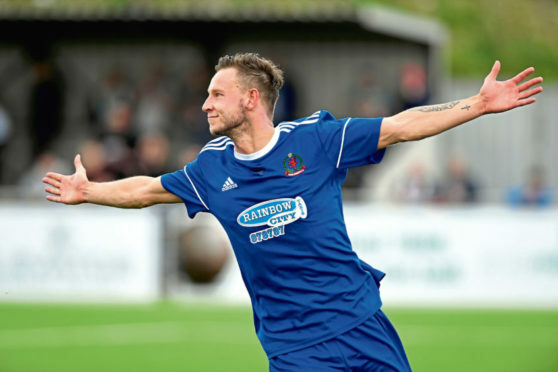 Elated Cove Rangers striker Park said: “It was a great winning goal from Mitch Megginson, the pitch was a wee bit bobbly but I managed to beat my man and get the ball across the face of the goal for Mitch to supply the finish with a tap-in. “Obviously I’m delighted that we’ve managed to win the league again, that’s the aim at the start of every season and it’s great to get it done and dusted with a game to go. Five minutes before kick-off Cove made a very late change, full back Harry Milne pulled up in the warm-up and experienced defender Alan Redford was promoted from the bench. In the sixth minute a brilliant 25 yarder from Forres attacking midfielder Andrew MacRae, the reigning Highland League young player of the year, looked net-bound until Stuart McKenzie in the Cove goal threw himself full-length to tip the ball round the post for a corner kick. Cove opened the scoring in the 24th minute when Daniel Park swept in a cross from the right and Mitch Megginson was on-hand to clinically clip the ball past Knight from six yards. On the half hour only some desperate Cove defending in the six yard box stopped firstly Graham Fraser and then Ross MacPherson from giving Forres a deserved equaliser. In the 62nd minute Cove substitute, talented young midfielder, Sam Burnett, almost made it 2-0 with his first touch of the game but his 12 yard hook-shot flew over the bar. Livewire Park almost made it 2-0 in the 71st minute when his angled drive came back of the base of the post with Knight beaten.